Two bear cubs bring Alaska traffic to a standstill as they try to cross a highway, before mama bear directs them back into the woods. The cute scene halted the traffic on Southbound Lake Otis and was recorded on camera Mama bear helps two cubs cross the street at Lake Otis. 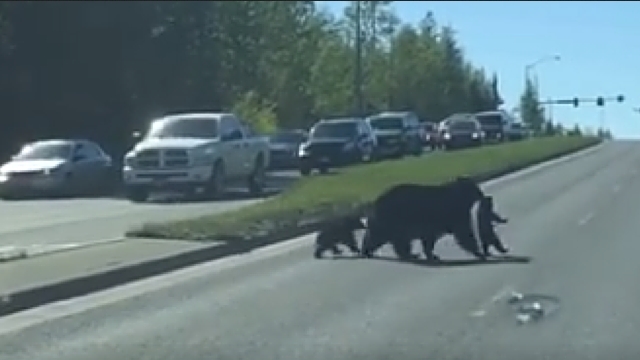 Karena Hostetler captured video of the bear and her two cubs crossing the street in Anchorage, Alaska, while she was on her way to work Sunday. The mother bear is seen grabbing one of her cubs carefully by the neck and walking across the street, stopping traffic in both directions. Alaska is bear country and one of the few places in the world where all three species of North American bears live. You may have a chance to see a bear in Alaska. But even if you don’t you will never be far from one. Respecting bears and learning proper behavior can help you avoid conflict—and help you know how to react if you do see a bear. Responses to "Mama Bear Carries Cub With Her Mouth To Cross Busy Road In Alaska"